I received an invitation to attend the media launch of Energizer Night Run. The first thing that entered my mind was “Me? Am I part of media?” Back in high school, we’d be asked to choose between three subjects: Home Economics, Technological Learning Education, or Journalism. I’d always choose H.E. or T.L.E. but never Journalism. I’d rather embroider table napkins or change light bulbs instead of writing an article. I’ve always been called Sandra by my friends but when I started blogging, I decided to introduce myself as Sandi. I wanted to reinvent myself. No longer was I the weak and fatigued person. I was going to be a runner. I blogged to journal my progress and to remember what I felt during the runs. My blog was just an outlet for my running stories, never expecting anybody to actually read it. So when I was invited, I was pleasantly surprised. Anyway, back to my story, I accepted the invitation and attended my first media launch. Not knowing anything about it, I was excited and scared at the same time time. “Seize every opportunity and embrace the experience,” I said to myself as I drove to San Miguel Avenue where the launch was held. There were about eight people in the conference room. I looked around and saw a lady at the back sitting by herself. I decided to sit with her. I introduced myself to her and she asked me “What’s your publication?” In my mind I laughed. I saw her name tag and it said “Camille, Daily Tribune”. I told her it was my first time to attend such an event and she said, “Me, too. Shhh!” Newbies at the back row! Haha. Camille was very young and looked like she was fresh from college. She asked me “Did you also take up Journalism?” I’m actually a dentist. I trained how to fill cavities and how to pull teeth out. Anyway, the room started to fill up. The one in front of me was from the Philippine Daily Inquirer and he had a big, high tech looking camera with him. I thought, “I’m so out of place.” Nevertheless I stayed and observed. I learned that there were actually two kinds of journalists there: runners and non-runners. The runners’ questions were different in a sense that they were concerned about the race’s details like distance categories, the race organizer, fees, and what’s included in the race kit. While the non-runners asked about Energizer’s advocacy and charity. I recognized other run bloggers and after the launch I introduced myself to them. They were very nice to talk with. Rene and I talked about the Boston Marathon. He was even wearing a race singlet to show support to the victims. It was a sad week for the running community. 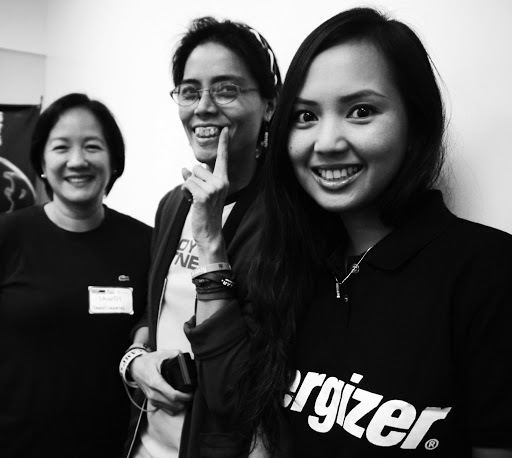 Marz and I talked with Joan Mendoza, brand manager of Energizer and asked her more about the race. I also had a very nice chat with my Fitfil coach, Air. He was the one who invited me.